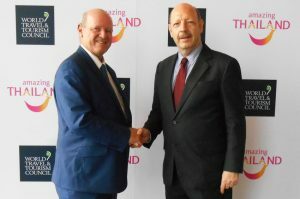 Bangkok (Thailand) – April 28, 2017 (travelindex) – Some the most influential business executives in the travel and tourism industry have converged on Bangkok for the World Travel and Tourism Council’s 2017 Global Summit. The WTTC Global Summit addresses the issues which affect the sector as a whole, for an invitation-only audience. The Summit kicked off with the launch of the ‘Is It Too Much To Ask’ advocacy campaign, calling on individuals and Travel & Tourism organisations to commit to tackling the issues currently facing the sector and the planet. The WTTC Global Summit is an event for the leaders of the Travel and Tourism sector, who gather each year, to meet and share their views and insights on many pertinent global topics, in both a business and social environment. The 2017 Summit was an opportunity for Mr. Alain St. Ange, former Minister of Tourism from the Seychelles and Mr. Bernard Metzger Founder of Travelindex to meet. Alain St.Ange from the Seychelles is one of six candidates contesting the May elections to head the World Tourism Organization (UNWTO). Armenia, Brazil, Columbia, Georgia, Korea, Seychelles and Zimbabwe are the countries that are in the running with candidates already accepted by the UNWTO Madrid Office. The election will be held on May 12 at the organisation’s headquarters in Madrid, and will be voted on by ministers of tourism from 34 countries. The World Travel & Tourism Council (WTTC) is the forum for global business leaders in travel and tourism comprising the presidents, chairs and chief executive officers of 100 of the world’s foremost companies. It is the only body representing the private sector in all parts of the travel and tourism industry worldwide.